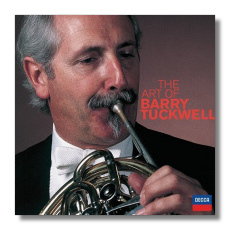 This jam-packed compilation is indeed a worthy tribute to the master of horn players, Barry Tuckwell who is famous, nay legendary for his interpretations of Mozart and Richard Strauss, who are included in a good number here. The first disc collects some interesting rarities from the baroque era culminating with Beethoven's early Horn Sonata and Mozart's majestic Hon Concerto #4. I greatly enjoyed the Knechtl concerto, which I had not heard before and also enthused on the lovely concerto by Michael Haydn. Tuckwell's interpretation of Mozart's 4th is also of a very high caliber, perhaps not as superlative as Dennis Brain's classic Philharmonia account but it arrives quite close anyway. The Beethoven Horn Sonata is very beautiful with the magnificent Vladimir Ashkenazy accompanying Tuckwell with sympathetic prowess. Ashkenazy is also exemplary in the Danzi Sonata whilst the ASMF strings provide a perfectly lucid partnership for the Cherubini Etude. Most of the second disc is handed over to Richard Strauss and Tuckwell's interpretations of the composer's concertos are legion, especially the First in the classic recording with István Kertész and the LSO. Kertész also conducts fresh and invigorating performances of the Second Horn Concerto and of Franz Strauss' contribution to the genre in clear and astonishingly vivid recordings. There are also short pieces from 'Capriccio', a fine rendition of Saint-Saëns' Romance for horn and piano and Alun Hoddinott's difficult Horn Concerto. There will be those who have most of these classic recordings in their respective collections but the Ashkenazy chamber items are appearing for the first time on CD as is the Hoddinott concerto. Otherwise, this is a fine tribute to a great horn player who has done himself proud and made a shining name for his often overlooked instrument on his 75th birthday.